Army Recruitment Rally Bharti Varanasi 2019: Army Rally Bharti Mirzapur, Varanasi, Jaunpur SSC, Ghazipur, Sant Ravi Das Nagar, Azamgarh, Ballia, Gorakhpur, Mau, Sonbhadra, Bhadoi, Chandauli and Deoria districts under the area of Army Recruiting Office VARANASI of Uttar Pradesh State. 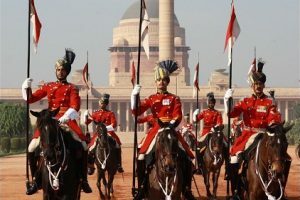 ARO Varanasi Age, Height, Weight, Chest, Education Qualification, Physical Standard, Physical Test, Medical Test, Written Test of Army Recruitment Rally Bharti BRO Varanasi eligibility criteria for recruitment, ARO Varanasi army bharti date, notification, result details are given below. Height for Solder GD, Soldier Pharma, Soldier Tradesman, JCO Catering (ASC) / Survey Automated Cartographer (Engineers) and category –169 centimeter or 1.69 meter. 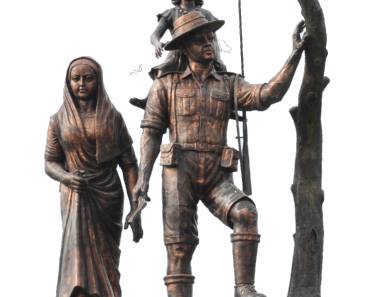 Height for Soldier Technical and Soldier Nursing Assistant– 169 centimeter or 1.69 meter. Admit Card Army Written Exam Varanasi: Admit Card/Hall Ticket for Written Examination will be issued on completion of PFT, PMT and Medical Test to the candidates. Admit cards for the CEE for the Review Fit cases will be issued at Varanasi ARO after getting medically fit by concerned specialist/specialists at MH/ CH/ BH. Written Exam Date and Place Varanasi: Written exam of ARO Varanasi recruitment rally bharti for Sol GD, Sol Clk/SKT, Sol Tech, Sol Tech NA and Sol Tdn will be held as per program. Relation Bharti: Relation recruitment rally bharti for son/brother of serving/retired/ ex servicemen of ARO Varanasi, Through online application. Outsider Army Bharti: Recruitment of Son/brothers of serving persons who are serving in the area of BRO Varanasi through Outsider Sanction. Army Sports Recruitment Rally Bharti: Sports Army Rally Bharti for Sportsmen recruitment in the Army for candidates of districts under ARO Varanasi through online application. ARO Varanasi Army Recruitment Rally. ARO Varanasi army bharti date. ARO Varanasi army recruitment notification. ARO Varanasi Army Bharti Admit Card, Gopalpur army recruitment rally bharti result. 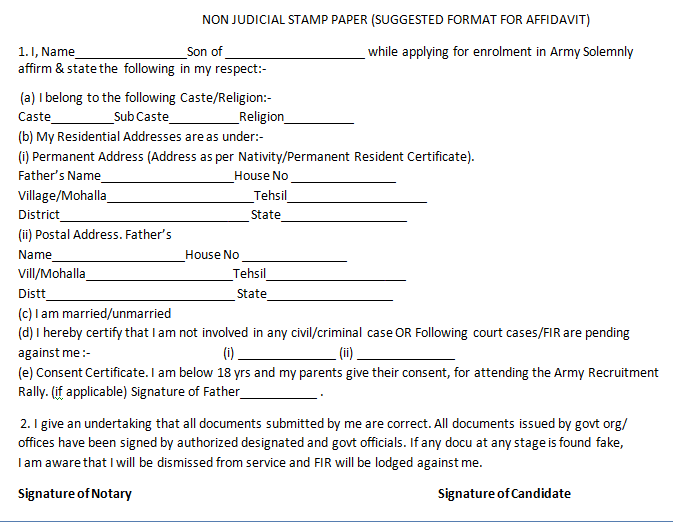 ARO Varanasi online application form army bharti. Cut off date for age, cut off marks Varanasi army bharti. Jobs notifications Varanasi. job notification for age group 16 years to 42 years of age Varanasi. Apr 2017 hai ya 2018 sir?? 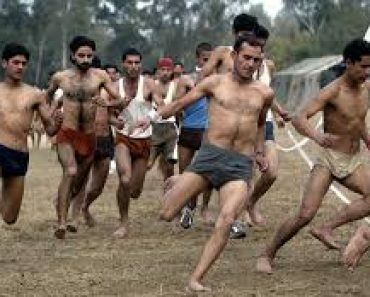 Kuki Apr 2017 k bad to run abhi v pahle hi ho rha h..
After completion of the age 40 there is any chance in Army service for 10th pass. Bhadohi se hu aro varnsi mai join indian army ka form apply kar diya hu. Hello sar me kosambi se hu kya me Varanasi se bharti ho sakta hu kya me gorkha hu document India kousambi v ka hai..
Sir 1.6 m. Ke liye ranig time kitna hota hai? Sir mera 12th me Hindi ke paper me sirf 33% hai aur sab subject me 50%se 60% hai ham army ka form dal sakty hai. 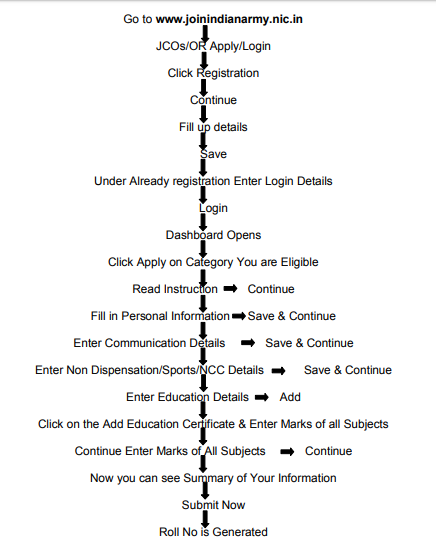 sir, kya Dist- Azamgarh ka form july se online hoga.bharty kab tak hai…. 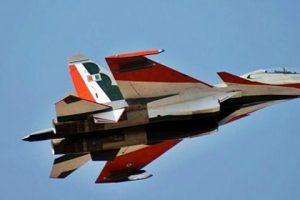 sir mera age 16yeats 10 month mai Army gd kee liyee appply kr saktata hun n …. Sir Deoria jile ki Bharti January 2018 me hi hogi ya October 2017 me hi hogi.. Bataiye please…! Hi Abhigyan, Abhi tak koi badlav nahi hai. 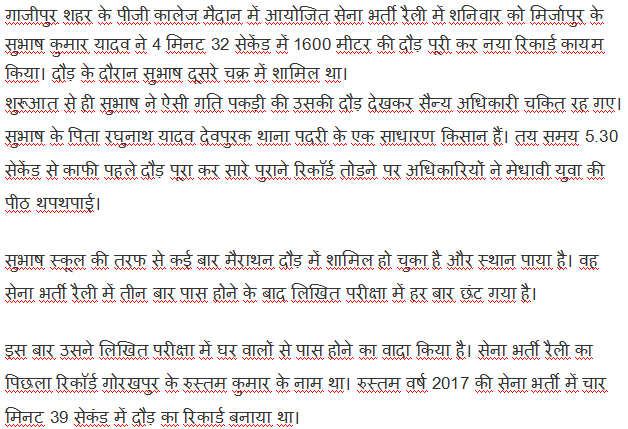 Sir, Azamgarh ki army bharti kab tk hogi plz sir? 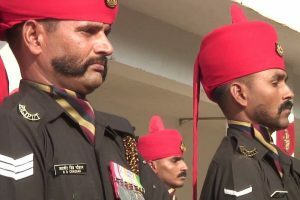 mera birthday 05/08/1994 hai kya mai army bharti dekh sakta hu. Hi Ajay, kya 10th ke certificate aur mark sheet alag alag hai. Yadi alag hai to DOB as per Certificate honi chahiye. 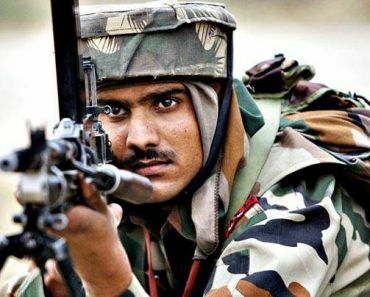 Hi Dheeraj Tentative army bharti programme for Deoria is 06 to 16 Dec 2017. Hi Dinesh, As per your qualification you are not eligible for sol clerk being less%. You may apply for other trade. Hi Dinesh, For GD Qualification: 10th / Matric / SSLC/ High School pass with a minimum of 45% marks in aggregate and not less than 33% marks in each subject. Please wait for date of online application, apply as per your eligibility. Hi Gyan Very Good, Apply now. Yes, Jam kar taiyari karo. Hi Prajapat, Aap kya janana chate ho? Hi Sanjit, PFT ki taiyari karo, final date aane vali hai. Sir ghazipur army rally ka farm online kb hoga . Sir Hawaldar ki direct bharti ghazipur ke liye bhi hai . agar hai to iska awedan kb se hoga . Hi Vikas, Physical pahle hoga. Hello Shashi, Pahle Physical hoga, man lagakar taiyari karo. Sir Maine suna h army me ab aage exam pahle hoga agar aage aisa hota h to ncc c certificate walo ko kya ho skta h plz rpl sir…?? Apko kya lagta h apni ray bataiye plz sir..?? Ncc c walo ko agar pahle exam hota h to aage exam hoga ya chhot rahega… ??? anuman kya ho skta h ap apni ray de plzzz…. Hello Rohit, NCC Certificate holder ko GD me bharti hone ke liye pariksha me chhoot hai, bhavisya ke bare me jo niyam ayega dekha jayega. Aap esi bharti me safal hon. Dhanyavad. Hi Khan, Prepare yourself for army recruitment, apply and go ahead. 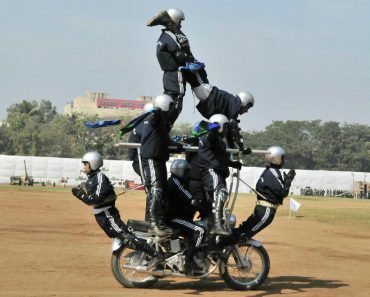 Sir ji banarsi army rally me odisha ka admi apply karsakti ho kya…. Sir I am diploma holder in mechanical engg. My height is 164 cm for which post I can apply. Hello laishram, apply from aro agra. Hello Pande, GD ke liye height 169 cm honi chahiye, height badhaye .5 cm to aap ke khade hone ki position me a jayegi. Hello Deepak, Achchhi tarah se taiyari karo, aane vali bharti ke form bharen. Hello Bittu, Aap apply karo. Hello Yadav, check on “Army bharti medical kikali” for complete information, fir bhi na samajh me aaye to comment box me likho, aap ko sampurn jankari di jayegi. Hello, You can apply from your ARO all the benefits will be applicable to you for relation bharti as per rule. Hello, Clerk ke exam me merit me aane ke liye jitna ho sake jada se jada number lane ka prayas karo, merit high jati hai. 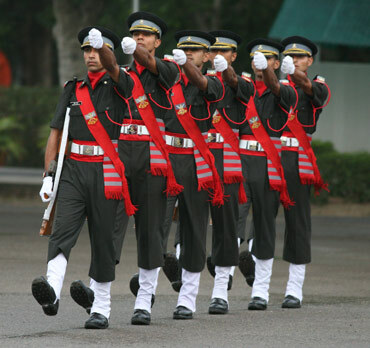 check on “Soldier clerk selection procedure kikali” for complete information. Main u. P Gajipur Distt. 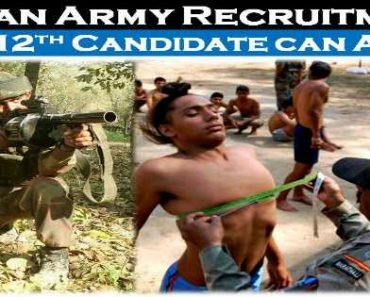 Ka rehne wala hu, me kya kanpur or Lakhnau ka army bharti apply ker sakta hu?? Main Gajipur (u. P) Distt. Ka rehne wala hu. Kya me kanpur or Lakhnau ki Army rally me apply ker sakta hu??? Hello Abhishek, You can apply for army recruitment only from ARO Vanarasi, visit on “Ghazipur Army Bharti” for complete information. Hello Vijay, Tiayari karo bharti aane vali hai. Hello Abdul, contact aro varanasi for detailed information. Hello Kasim, Yes, get proper treatment and apply. 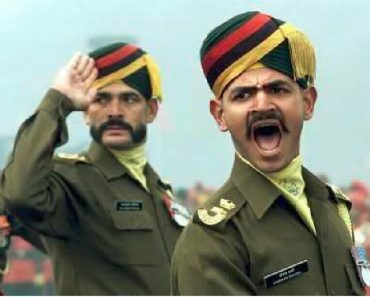 Hello Angad, army ki training alag-alag category wise hoti hai.